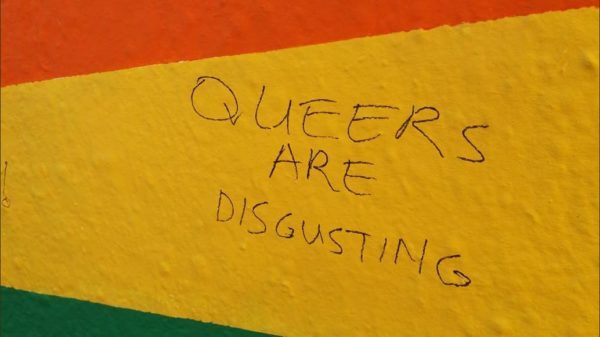 Queer community is outraged at vandalism of LGBTQ+ mural near The Matrix. 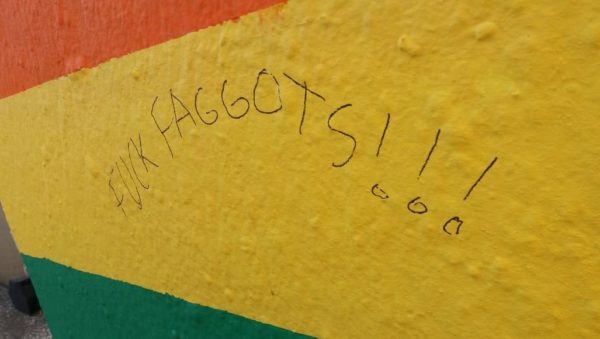 The Wits queer community is up in arms after vandals wrote anti-queer slurs on a wall painted in the LGBTQ+ rainbow flag near The Matrix. Members of Wits Activate, the queer society responsible for the mural, told Wits Vuvuzela that they would open a case with Campus Protection Services (CPS) against the perpetrators of the act of vandalism which was discovered on Monday morning, August 20. The wall was painted in the queer community colours last week in celebration of Wits Pride Week, which is running this week. Wits Activate president Zanele Hlongwane, a second-year BA student, told Wits Vuvuzela, “Firstly, Activate does not condone such hate speech and the threat of violence upon queer people, on campus or elsewhere. We aim to ensure that campus is a safe place for all queer students. “We are speaking to campus control to make sure that the people who vandalised the wall are held responsible for their actions,” she added. Acting Director of CPS, John Sibisi, said that an investigation had not been opened because a complaint had not been lodged yet. At lunchtime on Monday, Activate continued the tradition of hosting a mock wedding on the Great Hall piazza to introduce Pride Week. Some attendees took the opportunity to voice their support for the queer community and to speak out against the vandalism. 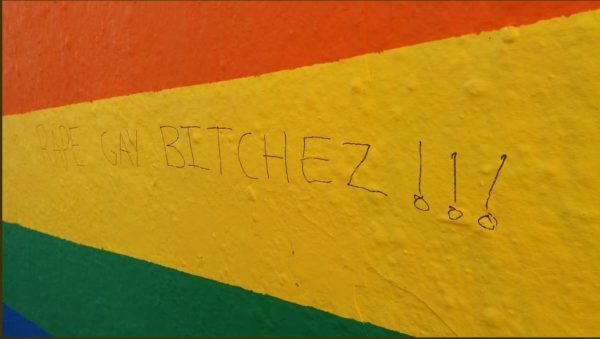 Third-year BA Law student Ngoni Lusere told Wits Vuvuzela that it did not make sense for others to damage the queer mural simply because they disagree with the LGBTQ+ beliefs. Jem Rose, who is doing first year in BA Fine Arts, said that the vandalism brought a bad light on what would have been a special week for the queer community, but it would not ruin the celebrations. “At first, I was upset, shocked and very hurt. I spoke with other queer people and they were also angry. I’m tired of homophobia and heterosexual patriarchy; it is so overpowering. “This Pride, queer people are going to be out there, visible and say ‘F*&# homophobes’,” she said. Pride Week events include a dialogue on toxic masculinity in queer communities on Tuesday, August 21, and a public lecture on Kinship the following day. The 10th annual Pride march will commence at 13:15 on Friday, August 24, from the Great Hall.